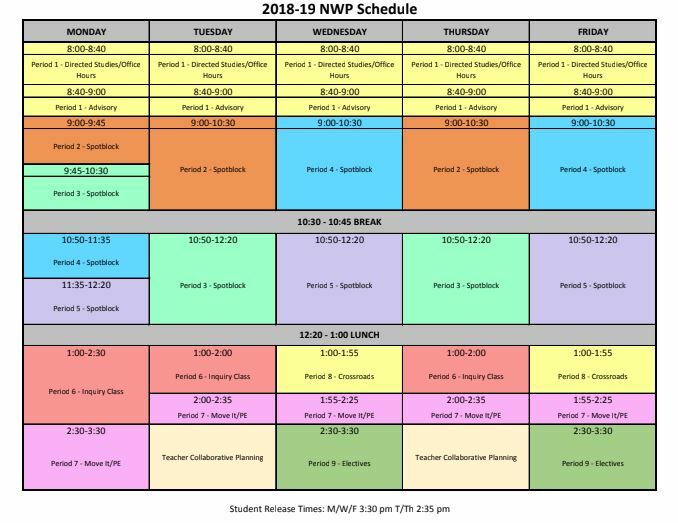 NWP utilizes a unique flexible block schedule designed to maximize its project-based curriculum. Students are often engaged in a flexible schedule. Students move through the integrated classes and teacher teams according to what phase of the project they're in, and according to what the instructional strategies and goals are for that day. This can be a bit confusing for new students at first, but they get the hang of it quickly. The ability to be flexible is one of the first skills that students acquire at NWP. Students spend their morning blocks in Spotblock Blocks with teachers in both small and large group work environments. Monday, Wednesday, and Friday afternoons are spent in either Inquiry Team, Portfolio, or electives. In addition to daily break and lunch periods, students participate in organized Move It physical education activities such as walks through the adjacent Laguna de Santa Rosa, and various team sports. Homeroom/Study Hall is available to all NWP students from 8-9 am each day. Students can receive one on one support with their teachers, do project work with fellow group members, study independently, take online courses, attend meetings with teachers and parents, or participate in school clubs and activities during this hour. Dismissal times vary to enable staff to meet for collaborative curriculum planning two afternoons each week. Dismissal times are: M, W, F at 3:30 pm, and T/TH at 2:30 pm.